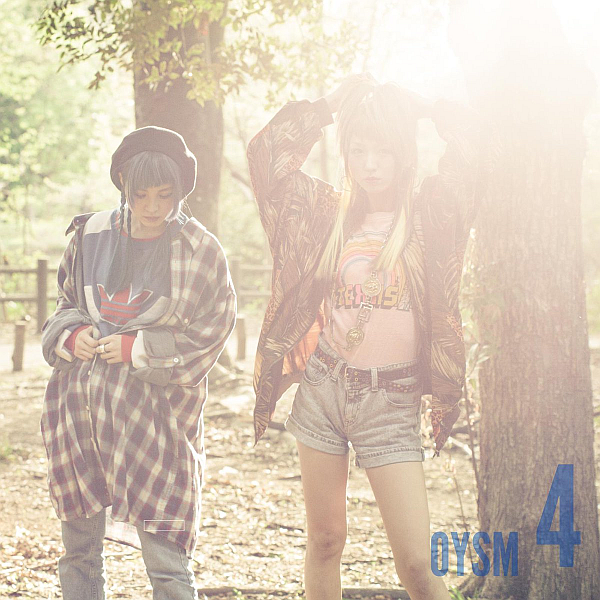 My thoughts on “4”, the latest album from Oyasumi Hologram. Some people have been waiting impatiently for a new BABYMETAL album, others a new Yanakoto Sotto Mute album. Me? I’ve been waiting impatiently for a new Oyasumi Hologram anything. Granted it was only 6 months between the release of this album and their two EPs “15” and “17” but I can never get enough new music from Oyasumi Hologram so it felt like an eternity to me. It also doesn’t help that the duo aren’t exactly known for putting out a steady stream of releases either. In my opinion, Oyasumi Hologram are one of the best Idol acts that practically no one ever seems to talk about. It doesn’t make sense to me that two girls (Kanamiru and Hachigatsu) who have some of the best harmonies I’ve heard in…ever really and who can perform songs acoustically, with a band or backed by synthesizer, drum machines, etc aren’t more popular. It’s not for lack of me trying either because I’ll happily talk anyone’s ear off about this group all day long. I just don’t get it, help me out here. Anyway, enough of that. So the rather literally titled “4” is perhaps unsurprisingly Oyasumi Hologram’s 4th studio album. Unlike a lot of albums though, this one features 10 totally new songs. You can’t really complain about that, well unless you’re me and it makes it so you can’t cut any corners and actually have to do a proper write-up on all of these songs. I’m looking forward to it though, as I’m interested to see which sides of Oyaholo come through on this release. Acoustic/Band/Synth, it’s all good to me though as long as Kanamiru and Hachigatsu are the ones holding the microphones. Let’s check it out. “colors” kicks the album off with Oyasumi Hologram set up in band configuration, and perhaps some NECRONOMIDOL fans out there might even recognize the bassist in the MV. I’ll be honest, I was instantly hooked by this song the moment I heard the opening guitar riff. It reminds me a lot of early 2000s Indie Rock bands, like maybe Feeder or something like that. Then the vocals come in and it’s just Kanamiru and Hachigatsu at their best honestly, great harmonies along with great tone that is left largely unprocessed. The chorus is nice and catchy and the way the verses are structured make this an easy song to get stuck in your head. Things are definitely starting off strong, and I love it. Following on from that impressive start is “freak” and the band setup remains in place for this song too. There are quite a few similarities between “colors” and “freak” although the latter is a little more fuzzy and Dream Pop leaning. There’s also wind instruments interwoven into the instrumental of this song which I thought was pretty interesting and not something you tend to hear every day. The guitar riffs are also very, very enjoyable. One of the big differences between “colors” and “freak” is that the vocals here get a lot more room to breathe and both Kanamiru and Hachigatsu get a bit more of a chance to show off their individual talents as well as their harmonies. Both of which they make sound absolutely effortless by the way. To be honest, I thought I’d accidentally put on a Sun Ra song when “stay” started playing. That opening 30 seconds sure was experimental, I’ll give it that. Things do eventually settle into some semblance of normality after that however, which does make the opening sequence seem even more odd when put into context. This song is quite different to the two that came before it, sounding much more melancholic and less upbeat. Soaring guitar sections coupled with impressive vocal high notes are contrasted by more steady, grounded moments which call for lower, smokey vocals that Kanamiru delivers oh so well. Some nice variance from the styles that have been featured thus far. You didn’t think all the songs were going to sound the same did you? The band take a bit of a break for the album’s fourth song “old moon”, which sees synthesizers and drum machines make their first proper appearance on the album. I really enjoy the instrumental on this track, with its fairly subtle elements of Dub making for a really great rhythm and pace to things. More wind instruments too which I’m definitely not minding at all, they worked really well with everything else going on. I did get the feeling however that the vocals were supposed to be the driving force behind this song and to be fair, who could blame them for that. This song is a perfect example of how well both Kanamiru and Hachigatsu work together, individually and everything in between. Listen to their flow when they sing together and how ridiculously well their solo parts just slot right into the song. Man, I’m really getting fired up here aren’t I? Wait, we’ve already hit the midway point of the album? Apparently so, and “raincoat” is a rather interesting song that if I’m being honest I wasn’t totally sure where they were going with it initially. It’s definitely different and appears to draw some inspiration from the Cumbia genre, which is where they appear to have got that rather catchy, whistle sounding beat from. A beat that endures for much of the song until it gets swallowed up by crescendoing synthesizers towards the end. Vocally things are a bit Lo-Fi on this one, with what I think is some kind of filter over the majority of the vocals to make them sound a little staticky. While I prefer my Oyasumi Hologram vocals as unfiltered as possible, I have to admit that it works well for this song so it’s hard to complain too much. They’re really throwing in some obscure stuff on this album though, huh? I’m not totally sure what to say about the album’s sixth track “hope”. That’s because it’s not really a song in any real sense of the word. It’s pretty much just 2 minutes of droning feedback from a guitar or something with some high frequency ethereal sounding mating call going on in the background. I’ve probably made it sound much more interesting than it actually is in all honesty. If they needed an interlude for some reason then sure, this works just fine I guess. Things get right back to business on the following song however. “iron” keeps things fairly simple with its dreamy Synth-Pop instrumental that keeps the song floating along with ease. It’s a pretty chilled out affair, something we haven’t heard too much of up to this point on the album. They haven’t tried to do anything too fancy here and like I’ve mentioned previously, when you have two great vocalists sometimes less really is more. Speaking of the vocals, Kanamiru and Hachigetsu are once again a joy to listen to and the emotions that they pour into this song sound very pure and sincere. I could seriously listen to them sing just about anything all day long. Not sure the title really fits the mood of this song but hey, if that’s the only critique that I have then things aren’t too bad are they? So we’ve established that I absolutely adore Hachigatsu and Kanamiru’s vocals by now right? Well one of my favorite performances of theirs on this album is on the song “nightbird”. It’s so raw that it’s like I’m right there listening to a live performance, although Oyasumi Hologram are one of the few acts where what you hear on the CD is actually what you’re going to get when you see them live the majority of the time. Go listen to their Band Demo CDs if you don’t believe what I’m saying, they’re that good. Anyway, enough gushing about the vocals for now, what about that instrumental? Are those some cues from Trap music that I hear? Granted it’s a really slowed down take on the genre but that’s what I’m hearing, but maybe it’s just me. We’re really rummaging around in the inspiration drawer for a lot of these songs, something other acts should perhaps take note of. The album’s penultimate track “sekai no owari” (no, not the band) sees Oyasumi Hologram combine their Electronic side with their Band side for an Indie style Synth-Rock song that proves that they really can do it all. Indeed this song is a great snapshot of many of the different style incorporated on the album, which would also explain their reasoning behind choosing it as one of the songs to use to promote it. If you like this song then you’re going to enjoy all of the other songs on “4” as well. If you’ve been reading me gush about this album and for some reason haven’t already gone off to check it out on one of the various streaming services then scroll down a little and hit play on this song in the Spotify playlist below. You’ll know pretty quickly if it’s for you or not. Things draw to a close with “tenshi”, a near 6 minute slow burn of a track that starts off with a rather beautiful percussion driven intro once again featuring some great vocal melodies. The song then begins to slowly layer in synthesizers and drumbeats as it begins to come to life. Around the midway point is where things really start to take off once we’re introduced to some gently fuzzed guitar and all of the building blocks of Oyasumi Hologram’s sound finally come into play. The song then takes these elements and uses them for the last couple of minutes to build to a crescendo that is not only a fitting end to this album but also a fitting description of Oyasumi Hologram as a group. A perfect way to end a fantastic album. In reality, “4” is going to be one of the best albums released in 2018 that hardly anyone in the Western fandom is going to talk about. If it were released by some trendy Indie band then I have no doubt that it would be getting showered with praise but for whatever reason Oyasumi Hologram are still yet to catch on as fully as I personally believe and know that they deserve to. Maybe this review might go some small way to changing that. Hopefully this won’t be the last we hear of Oyasumi Hologram in 2018, though their track record when it comes to releases hasn’t exactly been the most prolific…well ever really. I’m certainly going to go see them as many times as possible while I’m in Japan regardless because I just love their music that much. If any of you reading this are heading over to Japan in the next few months and Oyasumi Hologram are playing on an evening you have free, go check them out! You can thank me later.